I sold my first novel, BAIT MONEY, on Christmas Eve, 1971. My mentor and friend Don Westlake said of this, "Sometimes God behaves like O. Henry and there's nothing you can do about it." So the annual family Christmas celebrations were already scheduled and waiting. I remember sitting on the steps between the upstairs and our finished basement with a cup of punch in hand, feeling at once numb and yet realizing that my life had changed. For many years I wrote through the night, from midnight till perhaps 8 a.m. But in 1994 I directed a film, requiring me to be on set before 7 a.m., and that changed my inner clock. So I now arise around 7 or 8 a.m., tend to do business-related activities all morning (dealing with editors, my agent and so on) and then write all afternoon. If necessary, or if I'm so inclined, I'll do another session in the evening, maybe from 9 pm to midnight or one. I've been on a computer since 1981, typewriters before that. My first Nathan Heller novel, TRUE DETECTIVE, with its ongoing research, made for so much rewriting -- re-typing -- that I became one of the first writers I know to turn to word-processing. My first computer, which the cheapest cell phone would just laugh at, cost $8000 in 1981 dollars -- we sold one of our two cars to buy it. Part of the writing process rarely discussed, however, is thinking. If a writer hasn't thought through the next scene to be written, and just does some seat-of-the-pants flying, the result is likely to be second-rate or worse. Reflection is key. Perhaps that's why my wife doesn't let me drive anymore. I'm not much of a drinker, but I'd like to sit down with Archie Goodwin, unless he insisted I have milk. In that case, I'd share beers with Wolfe. 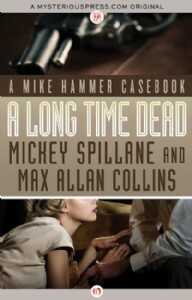 Mickey Spillane told me to take my wallet out of my back pocket when I sat down to write. It would, he said, prevent discomfort. He was right, though my wallet was never as thick as his. THE SOUTHPAW by Mark Harris -- brilliant use of first-person. BETTER DEAD by, well, me -- because it's a good example of my Nathan Heller novels and, unlike the above two, will earn me royalties. Find A Long Time Dead here!